Foundations gave away over $60 billion in 2014. According to Social Solutions, reporting expectations for these financial distributions have increased over the last five years and are expected to increase even more over the next five years . Driven largely by limited resources, these expectations increasingly focus on impact – evidence that shows what they are funding ‘works.’ However, many deserving grantee agencies that are stellar at providing services don’t necessarily have the experience or skills to know how to evaluate the impact of their work. Additionally, the foundations themselves may not know quite what to ask. Foundations often fund an array of agencies and programs whose goals have an implicit, if not explicit, alignment with their own mission. In an attempt to speak to that mission and make it easier to aggregate data in the end, many foundations create one generic reporting template for all grantees to complete. Unfortunately, this approach is not likely to truly capture the unique contributions and impacts of each grantee. Grantees get frustrated at trying to shoehorn their data into a report that doesn’t quite fit, and foundations end up with data that is less than compelling. Technical assistance from experienced evaluators at ICH can help to address this problem. ICH works with foundations to clarify and focus their grant-making goals and effectively document their own, as well as their grantees’, impact. Our approach includes a number of activities that can be utilized as a comprehensive package or individually, as needed. Collaborating with foundation staff, we develop an overarching, foundation-level logic model, a visual that depicts the underlying theory of how their grant-making activities will accomplish their goals. 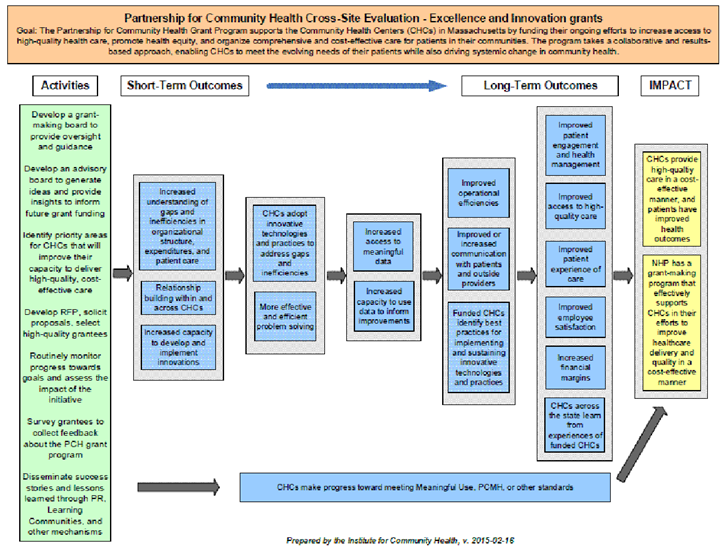 Example of foundation level logic model from the Partnership for Community Health (PCH) Excellence and Innovation Grant Program. This granting program has distributed over $17 million since 2014. We also work closely with each grantee to develop a project-specific logic model. Through this process we guide grant recipients to think about what their project can really accomplish and to ensure that their activities link to their anticipated outcomes. 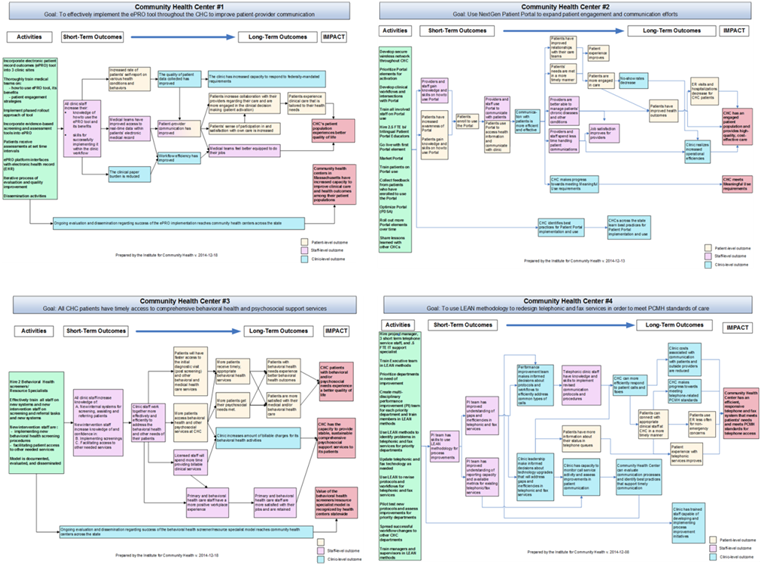 Examples of grantee level logic models from the Partnership for Community Health Excellence and Innovation Grant Program. Working in partnership with each grantee, we develop evaluation plans that are meaningful and relevant to them, while simultaneously measuring outcomes that align with the foundation’s overarching goals. 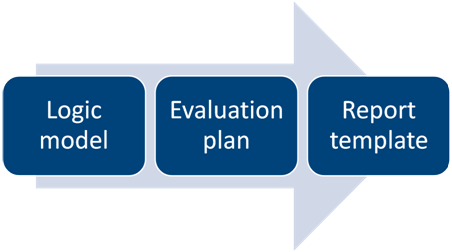 Using the grantee- and foundation-level logic models as a guide, we facilitate discussions to prioritize outcomes to measure and create evaluation plans that are focused, feasible, and useful. This process fosters buy-in to evaluation on the part of the grantee. We craft a tailored set of evaluation measures for each grantee’s project that is derived directly from their evaluation plan and flows naturally from the work they are doing. This ensures that the reports submitted by grantees capture project-specific outcomes that are connected to the foundation’s key goals, making reporting a useful and relevant activity for both the grantee and the foundation. We provide technical assistance to grantees, as needed, to develop data collection tools, and collect and analyze their evaluation data. We create summary reports at multiple levels of detail to meet the needs of different audiences, ranging from short, visual reports highlighting impact stories to in-depth data summaries for tracking individual grantees’ progress against goals. Comprehensive final reporting at the end of the grant period highlights program impact by rolling up individual grantee accomplishments into the foundations’ overarching goals. To help document the collective learning that occurs throughout the implementation of each grantee’s project, we conduct qualitative interviews that allow us to gain a deeper understanding of grantees’ experiences. We summarize and share back the qualitative findings to ensure that future grantees can build upon the collective best practices and lessons learned to optimize their work. Finally, we facilitate learning collaboratives among current and potential future grantees. At these forums, grantees have an opportunity to share what they have learned and participants can informally network and discuss projects. In this way, we ensure that lessons learned are disseminated to those who can benefit most. ✓ Provides grantees with data that they have prioritized as useful. This data can be leveraged for funding to sustain their work beyond the grant period. ✓ Because successes and lessons learned are disseminated strategically, others can replicate and expand upon the grant-supported work, magnifying the impact of the foundation’s grant-making activities. Given all of these benefits, our clients have found that with the support of experienced evaluators, the typically onerous process of grant reporting becomes a win-win for foundations and grant recipients.